You have been warned. Anyone who votes against the Daimler Double Six 50 Sport Corsica Drophead Coupe's induction into the Jalopnik Fantasy Garage will be ceremoniously banned, without possibility of appeal. Sayonara. Auf Wiedersehen. Fugedaboudit. [Not really, but you get the sentiment — ed.] However, we are not totally without heart, as Larry Forney can vote however he likes. No such luck for Tom Anderson. And now, we invite you to jump. Just look at this bloody thing! I've been wracking my brain trying to think of a car that's even sorta, maybe half as hot. And I'm not coming up with much. The Maybach Exelero looks comical, etymological and, frankly, childish by comparison. The Volga V12 Coupe? Getting warmer but actually no, not really. Citroen Traction Avant? Not even kind of. A 1958 Ferrari 250 GT Pinin Farina Coupe, in black? Very close, but also very far away. No, we'll just go ahead and proclaim it. In terms of hotness this Double Six 50 is the Sun to all other cars' Pluto. It's like Diana Rigg and Charlotte Rampling sunbathing on the Isle of Lesbos circa 1969. Catching a glimpse from any angle is like walking up behind Jessica Biel as she bends to tie her shoe. We've been staring and staring at pictures of this most gorgeous of all roadsters for the past week and it still shortens our breath while screwing up our pulse. So triple-hot is the Double Six (even the name is hot) that were we to peek under the ten-foot long bonnet and see a Geo Metro's 1.0-liter three-cylinder, it wouldn't matter. Hell, if it were powered by a Jack Russell terrier in a hamster wheel we'd still demand the Double Six go into the Garage. As it happens, "Double Six" means exactly that. The world's hottest hottie packs a 7.1-liter sleeve-valve V12. Lots of big luxury players at the time (Voisin, Minerva) opted for sleeve-valve designs. That's because, despite the crippling mechanical complexity, the lack of of spring-loaded poppet valves made these engines nearly silent. Rich folk (like the British and Jordanian Royal Families) dug wafting. While 150 horsepower from so many liters may not seem like bragging rights, in 1931 it was more than the Double Six's only competition (Rolls Royce) could muster. What's more, sleeve-valve engines were torque monsters. We once heard them described as having the instant-on torque delivery of an electric motor. There is one caveat. This Double Six ain't German; she's a Brit. In fact, Daimler is Britain's oldest marque. The Daimler we all know and think odd things about for being the Teutonic side of the soon-to-be disassembled Kraut/Yank hybrid is, or was in fact Daimler Motoren Gesellschaft, aka DMG. This company was headed by both Gottlieb Daimler and Wilhelm Maybach, the founding fathers of auto engineering bad-assness who invented stuff like four-stroke engines and the carburetor. And while those two liked motorcars just fine, their investors weren't so sure. So, rather than producing vehicles for export, DMG licensed its engine technology to companies in France, Austria, the UK and the States (Curious side-note: Steinway, the piano-maker, obtained the US rights to Daimler). That's why French Daimlers exist. A British train manufacturer named Fredrick Simms took up the patent rights and began building Daimler's engine in Britain under the name, "The Daimler Motor Syndicate Ltd." Simms, like DMG, proceeded to stick this engine not in cars, but boats. It took the vision of Harry J. Lawson to see the potential for putting the engines in land-based, tr4ackless vehicles. The only catch was that in 1885, any vehicle traveling on one of his Majesty's roads had to have a person walking in front waving a red flag (blame Stanley and his hoony Steamer). Turns out Lawson was a pretty influential dude, and he got the speed limit raised to a whopping 12 mph in 1886. (And you Londoners think you have it rough under Livingstone!) Anyway, a bunch of other stuff happened, and on January 14, 1886 the Daimler Motor Company Ltd. Was formed. And that kids, is how and why the Double Six 50 Corsica Drophead Coupe hails from Old Blighty. Sadly, not all Double Sixes were created equal. 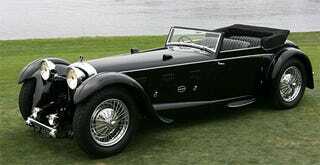 In fact, most of the big dog Daimler V12s were high-riding, seven-passenger limos. Except for one. Chassis number 30661 featured an "underslung" rear end that lowered the ride height significantly. So much so that 23" wheels had to be fitted for ground clearance. They were so big that the fenders are nearly over the hood. To our American eyes, those fenders imbue the Double Six Fity with perfect gangsa lean. The only larger wheels ever attached to a production vehicle were the 24" monsters that came with Bugatti's epic Royale, a car that's nearly one ton heavier than the Corsica Drophead. Also of note is that this Double Six started life as a convertible, became a hard top, and now saunters through the Nevada desert as a droptop once again. After a six-point-some-odd million-dollar restoration by RM, the Double Six Drophead's current owner, Bob Lee, took home a Best of Show at the 2006 Pebble Beach Concours d'Elegance. (Tear-inducing historical footnote: this car was purchased at auction in 1963 for $1,000.) And if that — coupled with the threat of execution — is still not enough to sway your vote, may we direct your obviously weary eyes to the hood ornament. Almost boiling.